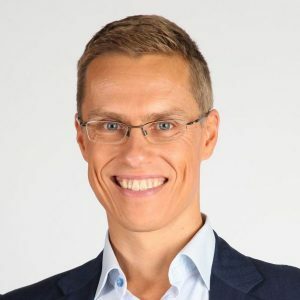 Alexander Stubb has been Minister for European Affairs and Foreign Trade since 23 June 2011. The ministerial portfolio covers matters from three ministries: the Ministry for Foreign Affairs, the Prime Minister’s Office and the Ministry of Finance. He previously served as a Minister for Foreign Affairs from April 2008. Before that, Minister Stubb was in the European Parliament from June 2004 where he worked on issues concerning the internal market, the EU budget and external relations. Before his career in the European Parliament, he was counsellor at the Permanent Representation of Finland to the European Union in Brussels. Minister Stubb has been a visiting professor at the College of Europe, and published many books on the EU, as well as a number of academic articles on EU-related issues. He completed his undergraduate degree in Political Science at Furman University, USA and obtained his PhD from the London School of Economics in 1999 on Flexible Integration and the Amsterdam Treaty.